The PeakTM Natural Climber and The StepperTM Natural Climbing Stone are the newest additions to the Natural ElementsTM Climbers series. 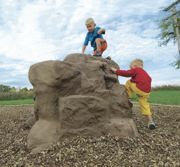 Designed especially for beginning climbers, each of these versatile, natural elements can be integrated with a new or existing PlayBooster® or PlayShaper® play structure, featured as an independent play event or grouped together in clusters to create a whole pathway for kids to navigate. However they are used, kids will be thrilled with these natural-looking climbers that provide hours of challenge and fun. Each is manufactured in one piece, making delivery and installation fast and easy. Today's recreational facilities have well-designed emergency plans backed by modern electronic security and life safety systems. 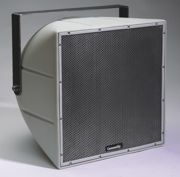 But during an actual emergency, a Community R-Series loudspeaker system can be your most effective tool for crowd control and evacuation. R-Series are recognized worldwide for their high intelligibility, long-term dependability and unequaled weather resistance. R-Series are often specified for high school and collegiate football fields, baseball and basketball venues, public swimming pools and other similar uses. Why not match the playful color of your playground, waterpark or recreation center with complementary colors of site furniture? New colors of 100 percent recycled plastic make Pilot Rock picnic tables, benches and trash receptacles fun and attractive in your landscape. All Pilot Rock components are commercial-grade so these products are able to withstand years of constant exposure to the elements and the public. Add custom plaques or engraving to personalize your site furniture. Acu-Trol® has created the new AcuPortTM to provide aquatic facility managers the ability to connect to Acu-Trol's aquatic automation controllers via Ethernet, Wi-Fi or RS-422/485 communication interfaces. The Acu-Trol® AcuPortTM offers communication solutions to the commercial aquatic equipment room with dedicated communication to Acu-Trol's AK110TM or the AK600TM controllers. Ready to turn it up a notch for your kids? Burke's all-new Intensity fitness play complex is designed to challenge and exercise young bodies while providing so much fun kids won't want to go home. Intensity was designed to meet the requirements for children ages 5 to 12. It appeals to children with a focus on basic physical skills, coordination, strength, balance and endurance. Intensity offers a variety of fitness play events that not only keep kids moving and excited, but also are modern and streamlined. This month's focus is spinning events, which include the Extreme Cyclone, KidForce Spinner, Swift Twist and Zippy Whirl. Penco Products Inc. has introduced a new line of high density polyethylene (HDPE) solid plastic lockers for use in wet area, recreational, outdoor, medical and educational applications. These HDPE lockers provide an outstanding alternative to coated metal. They resist the effects of moisture and many harsh chemicals; allow for easy cleanup of graffiti; and will not rust, dent or delaminate. The innovative one-piece body construction uses no mechanical fasteners or hardware. Even the hinges are designed without steel rods, which can pit and corrode when exposed to the environment. Shipped as welded units for quick installation, HDPE lockers use recycled materials and release no VOCs. Advanced Control Logix is offering a Non-Hazardous Acid/Base for service professionals. The pH+ and pH- Non Corrosive Acid and Base offered by Advanced Control Logix offers a non-corrosive Acid and Base solution for pH control of swimming pools. This liquid product provides a much safer option for pool operators and owners than alternative options of acid and base products. Both pH+ and pH- are non-fuming and carry all 0s and 1s on their MSDS sheets. The CardioBarbellTM Set Plus is a new adjustable barbell system from Power Systems that has color-coded plates to simplify weight identification. The barbell system allows users to get a full-body workout by combining cardio and resistance training, and the color-coded plates help classes quickly identify the appropriate weight, so sessions remain focused and run smoother. The CardioBarbellTM Set Plus includes a premium 51-inch steel bar with a durable, rubber-coated cover for comfort, a pair of threaded collars for safety and 35 pounds of color-coded plates. The plates are encased in virgin rubber to protect gym floors and reduce noise.